Transama was an Italian motorcycle brand, based in Pesaro, that since 1977 worked on the production of 50 cc, 125 cc and 250 cc trail bikes which are mainly sold in the USA. 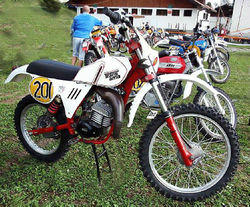 The 50 cc models used Minarelli engines of the larger models had Hiro engines. The technician Edmondo Rossi designed a moto-cross model with a 2-stroke Hiro engine. In a short span of time, a substantial group of moto-cross fans chooses the model as one of the best. After only a few years, due to financial problems, he passes the ownership to the Campanelli Brothers, that could not avoid shutting down the company at the end of the seventies.